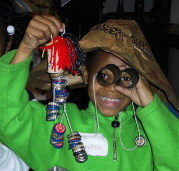 Worldplay gives a huge "Shout out" to Arvind Gupta: Turning trash into toys for learning!
" Enjoy his fantastic presentation! What can you make from a brown paper bag, a pencil, a pushpin, and pipe cleaner? See what the audience made! A FREE Workshop March 31st, 2001 Atlanta, Georgia. View the photos from our Toy-Making Safari through Southern Africa!